A short film inspired by one of the most infamous conspiracy theories in rock has been released. The Paul Is Dead conspiracy originally kicked off when Sgt. Pepper was released, where the back cover pictured McCartney with his back to the camera, next to the words ‘Without You’, as if he'd been replaced for the session by a doppelganger. It gathered pace following the release of Abbey Road, where a series of supposed clues hinted at McCartney's apparent demise. Paul Is Dead tells the story of what might have happened had the cheery mop top actually died. Rather than taking its cue directly from the conspiracy, which has McCartney perishing in a car accident, the film places the band a retreat in the Lake District, where he passes away after an unintended drug mishap. The remaining Beatles set out to replace the dead musician with a local singer, Billy Sheers, and to secretly bury the deceased atop a nearby hill. 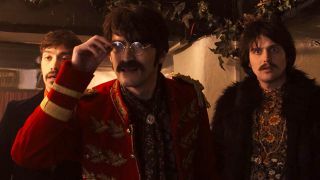 The film stars Reid Anderson as John Lennon, Basil Marples as George Harrison, Anton Tweedale as McCartney, and Ashley Pekri as Ringo Starr. "My friend and co-writer Ben told me about the conspiracy theory during a drunk taxi ride; I’d never heard of it before and found it really entertaining," says director George Moore. "I made one of those off-hand comments that people make all the time; ‘that would make a funny film’, but the following day we decided to actually make it happen. "At its heart it’s about what happens to a group dynamic when there’s a missing piece - but it’s also a colourful, psychedelic, tongue in cheek, fish-out-of-water comedy about characters we all know and love, that’ll leave you smiling long after the credits roll." The filmmakers are hoping to take Paul Is Dead to festivals next year, but you can watch it online below.